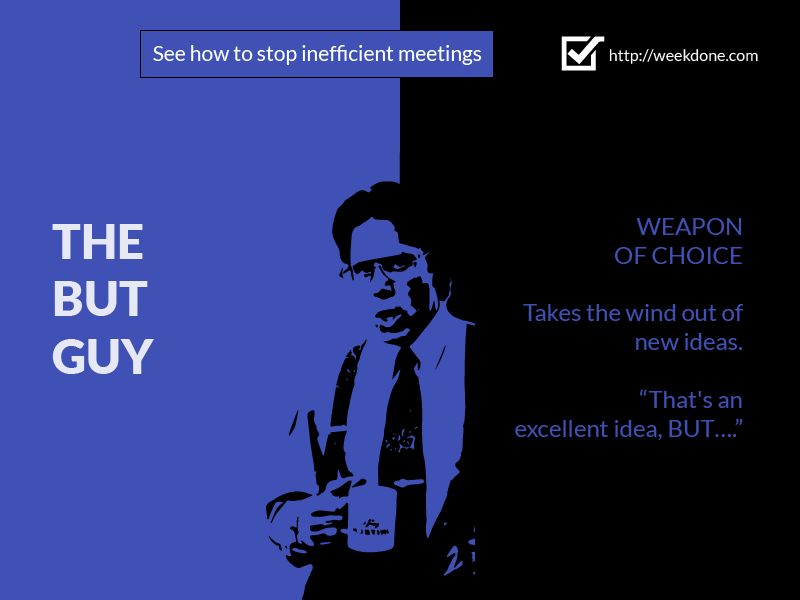 Had a bad meeting? Chances are that one of the following stereotypes ruined it. How to deal with them? Firstly, you should meet them, so you would know who you are dealing with. 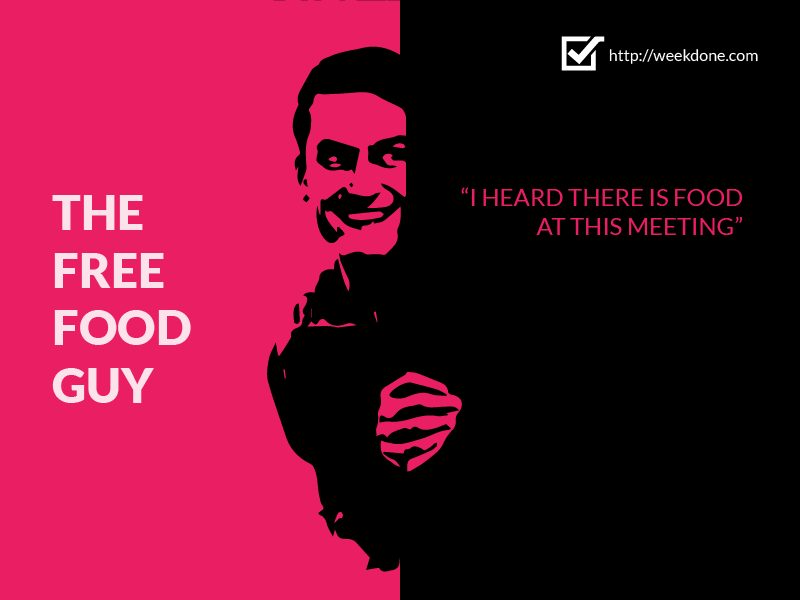 We all had those meetings, when you desperately need some help and finally come down to a decision or a solution. Furthermore, you have scheduled the meeting, so all the necessary people would be there. Everything seems to be prepared for success, but somehow the time went by so quickly and nothing productive came out of that meeting. Why? 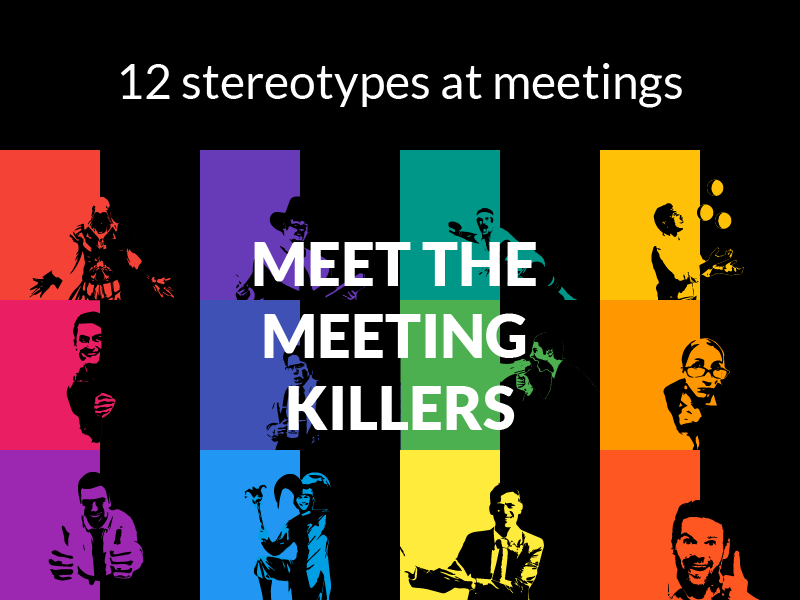 Chances are that one of these 12 stereotypes killed your meeting. 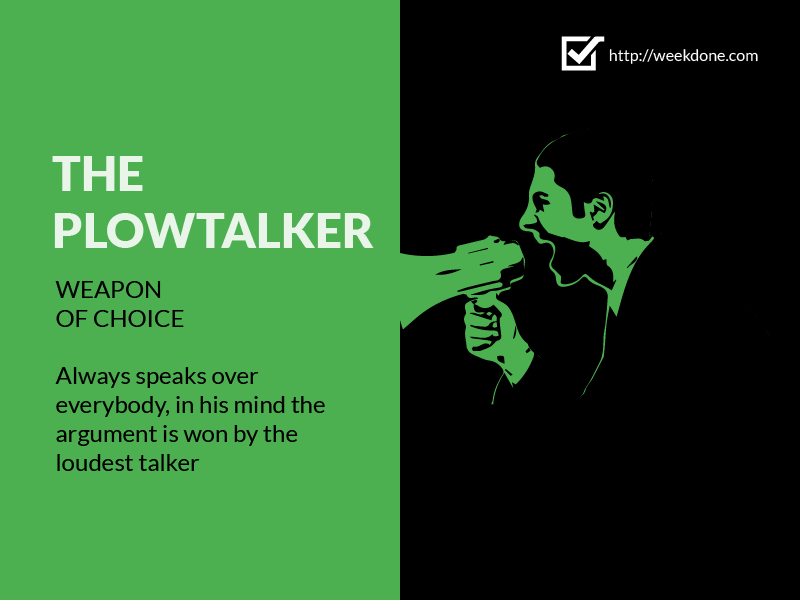 Was it the Plowtalker, the But Guy or smb else? 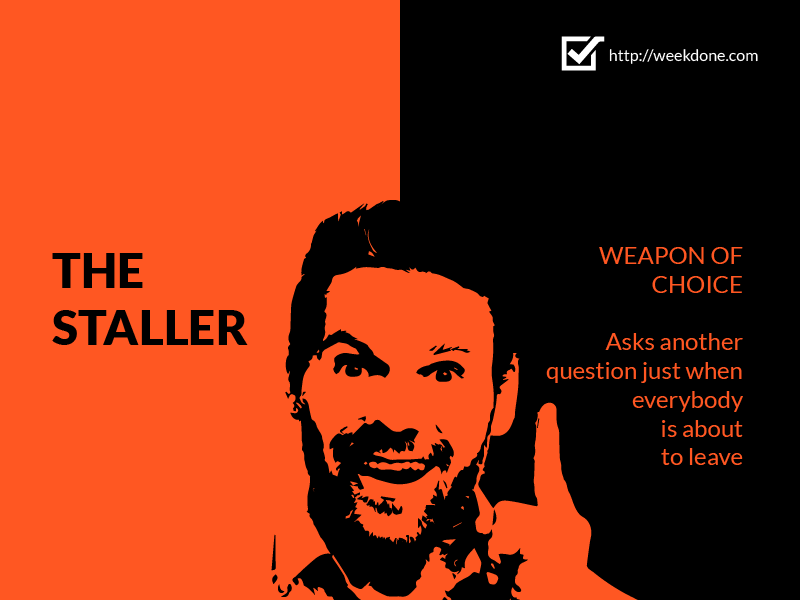 Check out the usual suspects and the solution Weekdone has provided. 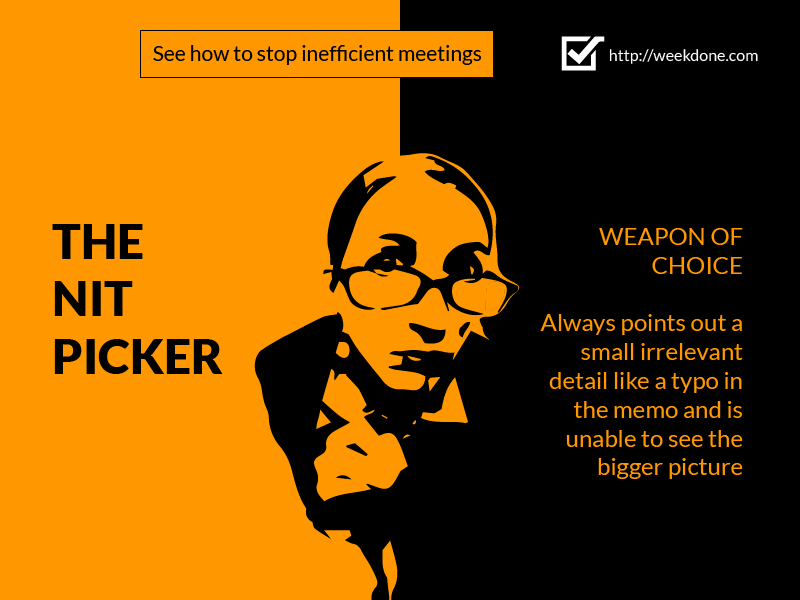 In case, you want the "Meet the Meeting Killers" poster – click here: Meet the Meeting Killers poster. (You can put it up in your meeting room, so everybody would be more aware of how they behave at meetings) Also, don't forget to tweet your favorite stereotype at meetings. Did you recognize anybody or maybe you recognized yourself? Don't worry, we all have some of these meeting killer qualities. 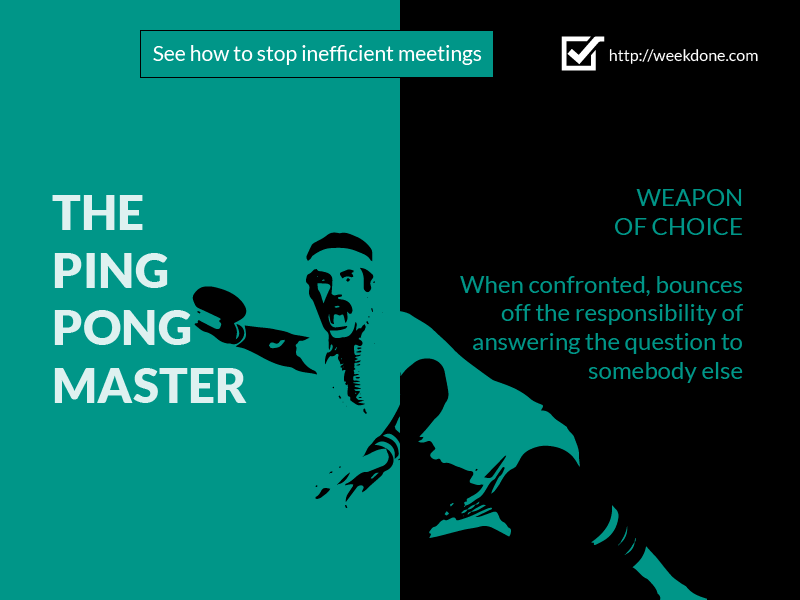 So, what can be done to stop these bad stereotypes at meetings? 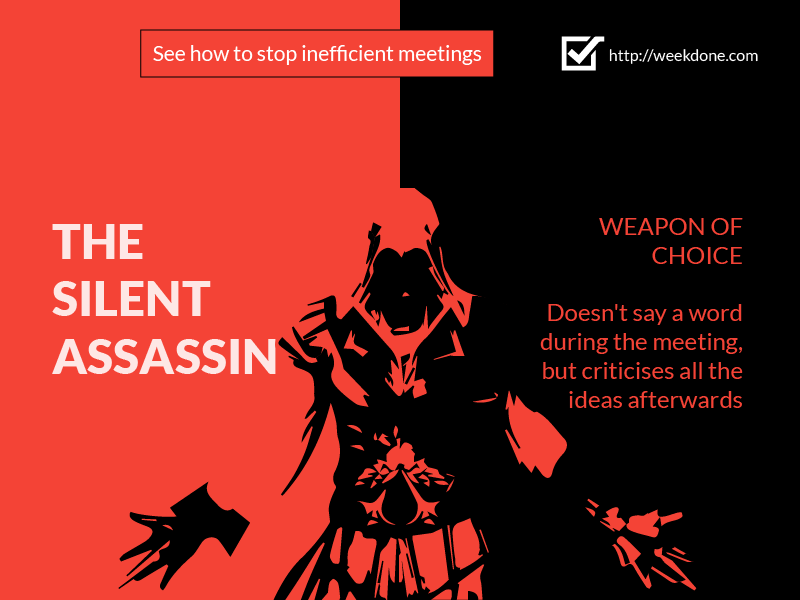 There are ways to disarm the meeting killers individually, but that would take too much time and energy. Much simpler way is to increase your preparation and focus, so there would not be any room for the bad stereotypes at meetings to operate. 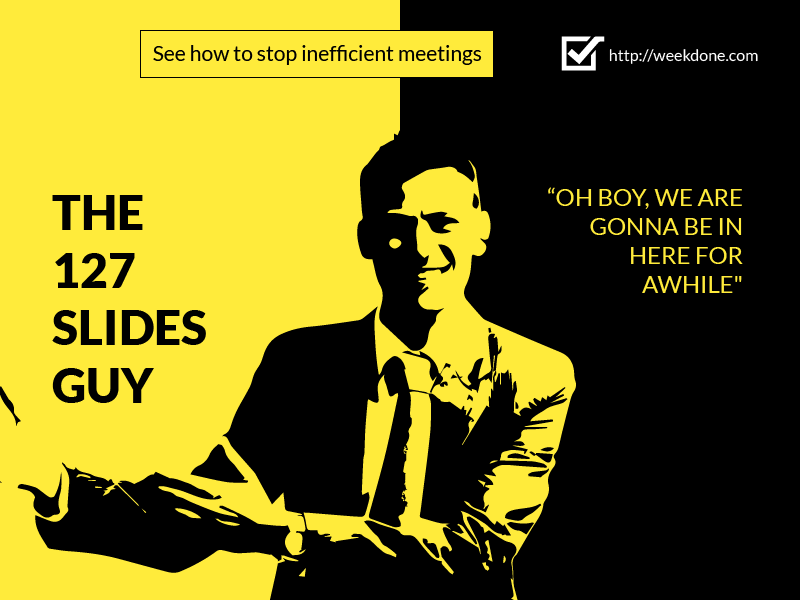 Firstly, stop having so many meetings. Every discussion does not require a meeting. For example, status update meetings. You can easily get rid of those by using Weekdone reports, which shows you what each of the team members have been up to. 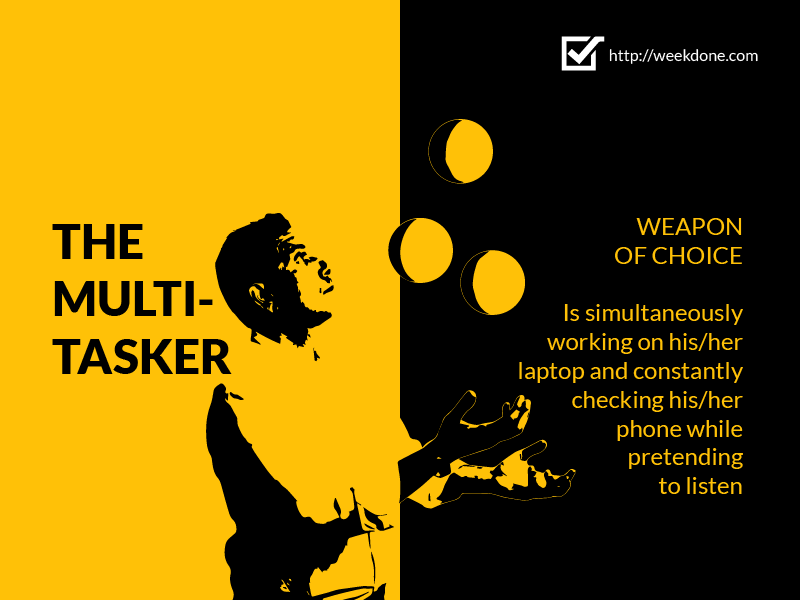 Furthermore, you can see the status of your team members, while you are on the go by using the Weekdone IOS or Weekdone Android application. 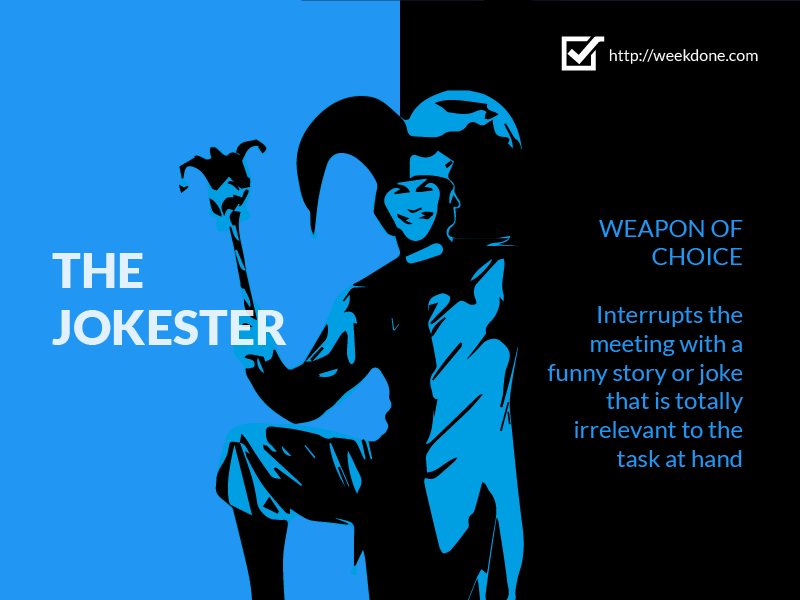 Secondly, if you still have to have a meeting – use Team Meeting Checklist in order to be prepared and sure the meeting killers know, what the goal of your meeting is. That will help them to be more on point. Thirdly, during the meeting – use Team Meeting Timer that makes sure every second is valuable. 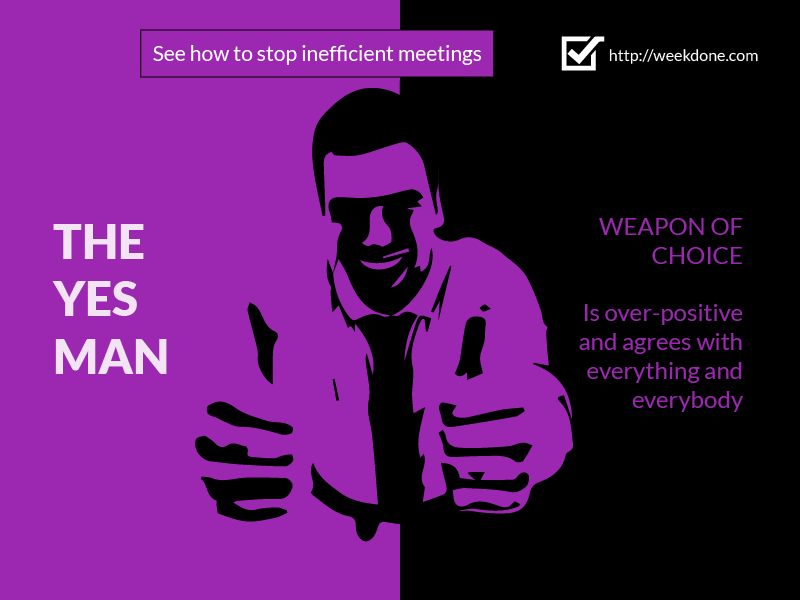 This will disarm the meeting killers most lethal asset – wasting time. 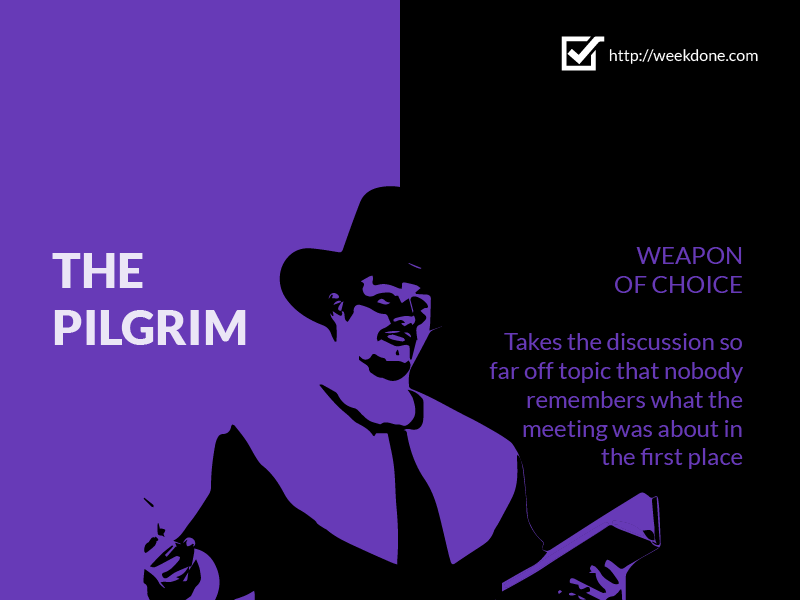 Would like to read more about meetings? Remember to follow us on Twitter, Google+ and Facebook for all about productivity, meetings, efficient meetings and more!